The worst idea in history is back. Communism has wrecked national economies, enslaved whole peoples, and killed more than a hundred million men and women. What's not to like? Too many young Americans are supporting communism. Millennials prefer socialism to capitalism, and 25 percent have a positive view of Lenin. One in four Americans believe that George W. Bush killed more people than Josef Stalin. And 69 percent of Millennials would vote for a socialist for president. They ought to know better. Communism is the most dangerous idea in world history, producing dire poverty, repression, and carnage wherever it has been tried. And no wonder—because communism flatly denies morality, human nature, and basic facts. But it's always going to be different this time. In The Politically Incorrect Guide to Communism, renowned scholar and bestselling author Paul Kengor unmasks communism, exposing the blood-drenched history—and dangerously pervasive influence—of the world's worst ideology. Start reading The Politically Incorrect Guide to Communism on your Kindle in under a minute. Paul Kengor has written a wonderful and very timely book about the factual history and true nature of Communism. It should be mandatory reading in every high school and college history course in America! As a longtime Russian language educator, and as one who served a tour of duty in the old Soviet Union, I can personally attest to the total accuracy and absolute veracity of his description of this perverse ideology and its disastrous effects on human history. No gobbledygook or academic double-talk here – just a straightforward, reader-friendly, factual, and well-documented narrative which is informative and thought provoking. Professor Kengor is a modern day Malcolm Muggeridge who, unlike so many contemporary history teachers, exposes Socialism/Communism to the refreshing disinfectant of sunlight. Kudos to him for standing up to the ivory tower radicals in our schools and colleges who peddle false narratives to an unsuspecting younger generation. I urge every patriotic American to get this book, read it, and encourage others to do so. It is indeed a breath of fresh air permeating the stale odor of toxic ideological indoctrination which sadly passes for “education” in our country today. I bought this to self-educate myself as to why a number of Americans today believe that this form of societal governance and control is superior to our democratic republican form of government and our capitalist society. Apparently, for those who extol the virtues of communism, merely having to read about, rather than experience firsthand, the purges, the oppression, and the suffering and degradation of the many by the few, doesn't mean much as these people probably think that they would be among "the few" who control "the many." I am amused by those within our society who live by the mantra "do as I say, not as I do". What they mean is, communism is for the masses, not for us elitists who preach it. Come to think of it, that mantra seems to be the guiding philosophy of most of our elected officials, regardless of political persuasion or ideology. This book should be required reading before graduating high school. The author's sentence structure makes this book easy to read. Previously, when I've read books pertaining to Marxist theory or political philosophy, the sentence structure was somewhat complex and it took a little time to mentally digest the meaning of the sentence, or thought. It is important to note that, in my opinion, the author's viewpoint is from "the right" (which isn't to suggest that it's an improper viewpoint). However, the facts entailed in this book, since I've seen them in other books I've read generally pertaining to this subject, appear to be valid. 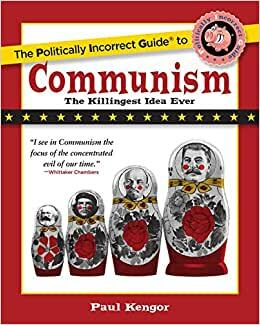 I recommend this book to read because I feel, circa 2018, people need to know what Marxism, Communism, and Bolshevism actually entail. If one thinks such ideologies are pious and "looking out for the masses" they may be rudely awakened by both the required social reorientation of these ideologies and the historical suffering of people when implemented. A lot of historical information and statistics. Politically incorrect to be sure but humerous in parts. You will definitely be able to hold up your end of the conversation with a friend who "thinks" Socialism or even Communism are a benefit to humanity. People really don't understand what they claim to believe. Read the book and never sit quietly again while someone on the left attempts to convince you how smart it is to be liberal.